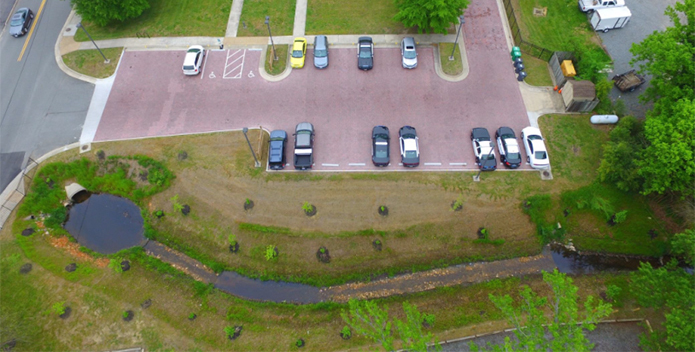 An aerial view of the completed stormwater retention project in Ashland, VA.
A parking lot isn't usually something to get excited about. But believe it or not, the Ashland Police Department's new lot is pretty innovative when it comes to fighting pollution. It started a few years ago, when it was time to repave the aging asphalt at the police station in Ashland, a small town north of Richmond. At that time, Ashland Town Engineer Ingrid Stenbjorn was beginning to look for ways the town could cut the amount of polluted runoff entering local waterways in an effort to meet new Virginia requirements. Instead of just covering the parking lot with a new layer of asphalt, Stenbjorn suggested installing permeable pavers. On most paved areas, when it rains, water just runs off the hard surfaces, washing dirt, oil, grime, grease, and other pollution into nearby streams and rivers. However, permeable pavers allow water to pass through, effectively stopping much of this polluted runoff. The project at the police station was the perfect chance to upgrade the lot with something more environmentally friendly. "Every time we have a maintenance need here in the town, we consider if there's a way we can also reduce the amount of pollution that goes into our waters," Stenbjorn said. There was just one problem. Ashland had a tight budget that year, and permeable pavers aren't the cheapest option upfront. Fortunately, the town was able to get support from Virginia's Stormwater Local Assistance Fund, which provides matching funds to effective projects that reduce runoff. Together with a separate grant from the National Fish and Wildlife Foundation, Ashland could pay for the whole effort. "It was a really bad budget year, but those grants made this project possible," Stenbjorn said. Even better, the grants also funded the restoration of a small stream that runs next to the parking lot. Before the work, the stream was in bad shape. It had a huge drainage area, and storms would send polluted runoff gushing through its deep channel, doing a lot of damage in the process. There was almost no life in the stream. The restoration widened the channel, which now allows flow from storms to spread out and slow down. Native plants are now taking hold in the new floodplain, helping absorb more of the water. Frogs and birds have returned to the stream. Since the project's completion in November 2015, it's not only cut down on pollution, but has also created a mini oasis next to the station. Ashland Police Department Chief Douglas Goodman said that the Department "was pleased to be a part of such an earth-friendly project. In addition to being environmentally sound, the new creek bed is such a pleasant sight to see and can be quite calming."